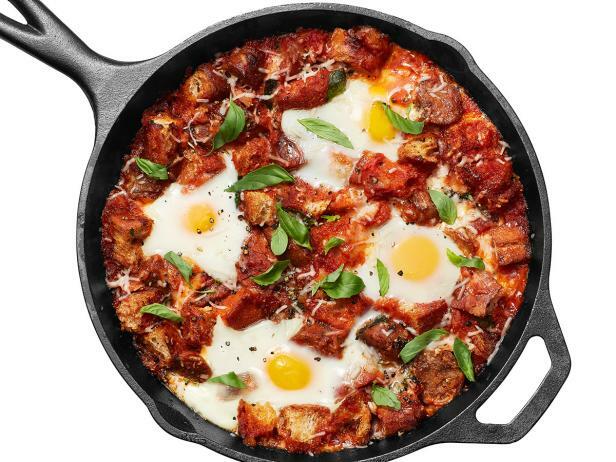 Eggs in Purgatory with sausage is a great brunch idea for this weekend. Eggs are also great for dinner. They’re inexpensive and full of protein goodness. Watch this video to see how easy it is to poach the eggs right in the liquid. You can read the whole recipe at the Food Network. From comments on the site, it looks like the 2 cups of marinara and 2 cups of water is way too much. People halve that so it’s not a mess. It’s also recommended to toast the bread cubes first and add them in later so they have a crunchier texture. I think if you put the bread right in the beginning, it would have disintegrated by the time you serve it. I could see wanting the bread in the sauce. But to make it lighter, I’d have toasted sourdough or French bread slices that I’d dip in to scoop up the yummy yolk. That limits the amount of bread you’re getting. Also, I love mild Italian sausage or Jimmy Dean Sausage with Sage. I think they both would be delicious. Hubby likes his eggs soft poached. I’d watch the timing carefully. The recipe calls for 4 to 9 minutes of cooking, but I usually poach an egg in ninety seconds. For onions, I think it would be better if you cut them into slices rather than chopping. I love a well cooked onion and enjoy tasting it. And I’d cook the sausage and then drain it. I don’t want all that grease in my final product. 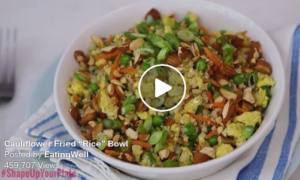 This can be a great Paleo recipe. Definitely the first thing is to leave out the bread. I’d also add in more vegetables. This would be great with some spinach or chard. For those that like kale, you could fit that in. Just chop it smaller and cook it longer in the marinara so it becomes tender. You could make a simple salad to go with this. A light vinaigrette would balance well. And finish off the meal with some fresh fruit.